2018 Was a Year of Firsts. It was the first time hulled craft were allowed to race in their own division. 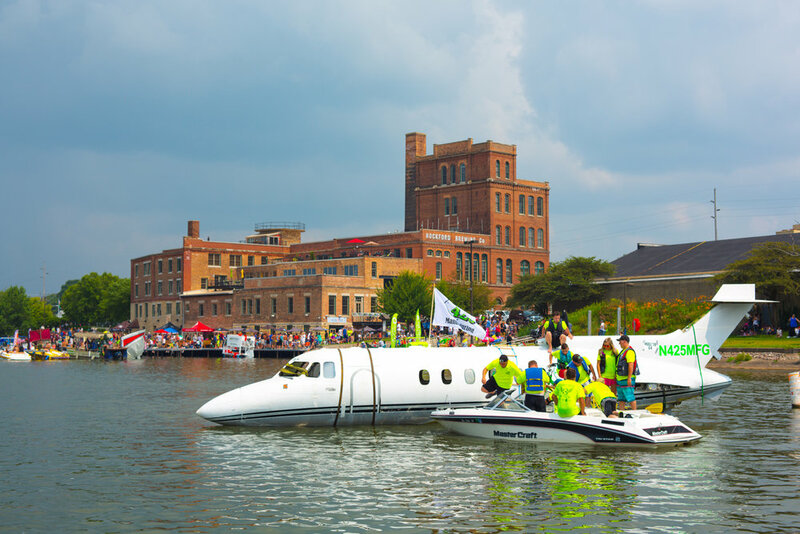 Who’d have thought someone would enter a jet aircraft - powered by dual Limebikes It was the second time a team of high school students designed and built their own raft, but it was the first time it won People’s Choice. 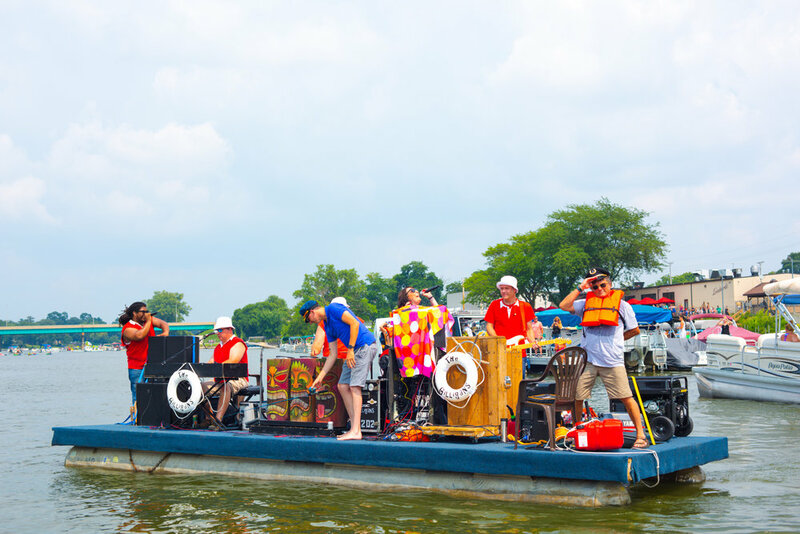 And, it was the first time a band on a barge entertained spectators up and down the river - especially one dressed as characters from Gilligan’s Island, the classic, beloved TV sitcom. It Ain’t All Fun & Games. Putting on this race is an enormous undertaking. 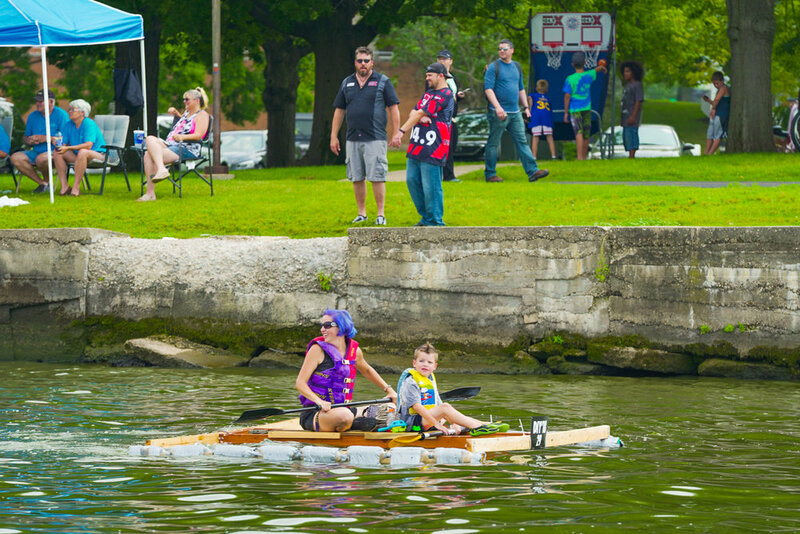 Hats off to all the volunteers who make it possible, including those who donate their time and their boats to keep competitors and spectators safe. That means you, too, law enforcement teams on sea and on land. Thank you. Thanks to the generous sponsors who gave up their treasure to help make our day in the sun possible. You’ll see their logos along the right side of this website. And let’s not forget all the raft builders who worked nights and weekends planning, designing, joining, carving, framing, sculpting, painting, nailing and bedecking their decks. Oh, and also you spectators! After all, it’s your smiles the shipmates work so hard to turn on. The Rock, She Was Shining. The river winds past us everyday. Mostly we speed over it or past it and pay it little mind - just as we pay each other little mind, seeing more of each other on little screens, ranting through finger tips flying over keyboards and touchscreens. Some say it even divides us, east and west. On the river on race day, we come together. We see each other and cheer each other. In preparation, we use our hands and our creativity and our ingenuity to get our ships together just so we can paddle like it’s 1999. 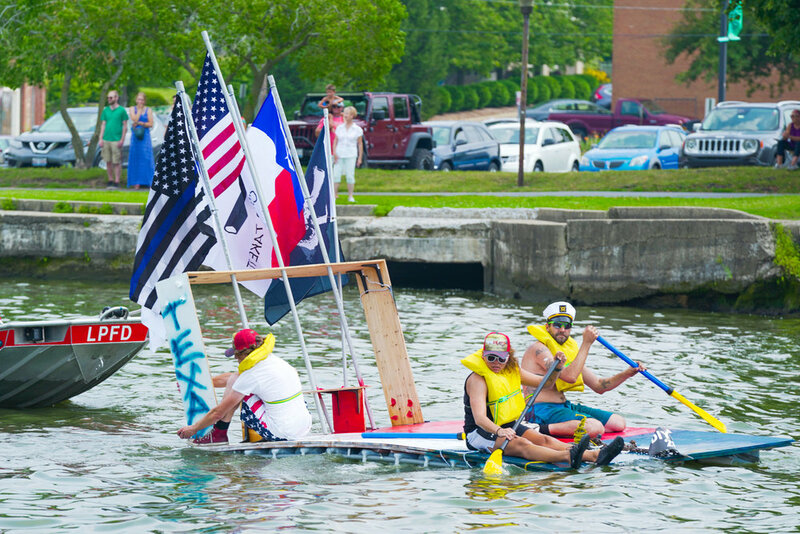 Enjoy the pictures and float on, river folk. 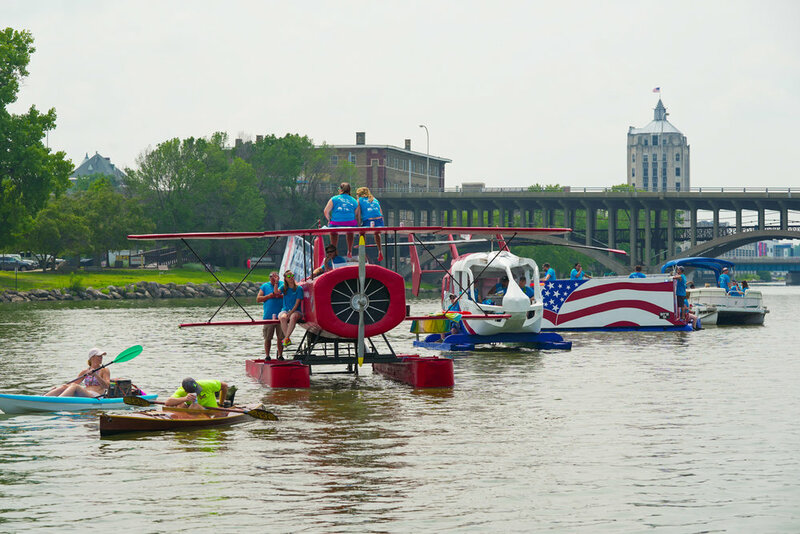 We hope you enjoyed the 2018 Rock River Anything That Floats Race. Stay tuned for details about next year's race. All the competitors finally got their ships together and they’re preparing to paddle like it’s 1999 today — race day, August 12, 2018. Spectators are getting ready for a fun-filled day in the sun along the Bike Path and at the fun and festive finish line at Prairie Street Brewing Co. Speaking of spectators; don’t forget to VOTE FOR PEOPLE’S CHOICE. Vote for the rafts you like best using their official race numbers. 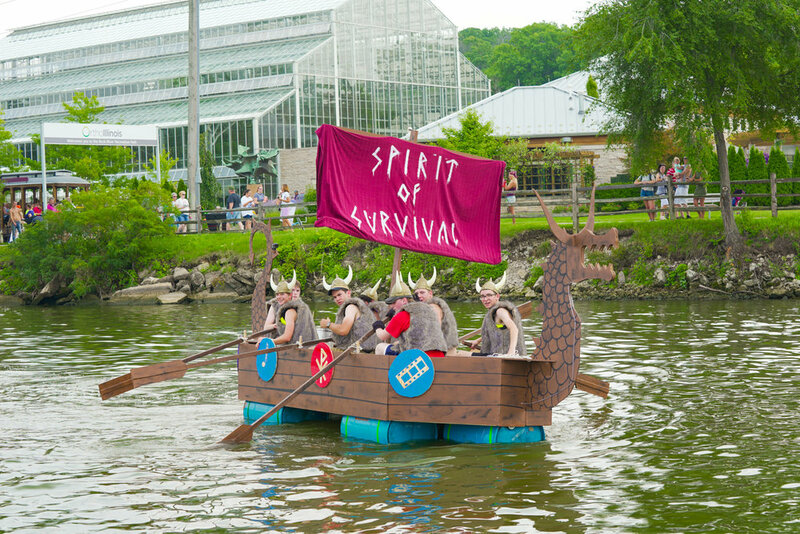 There will also be pictures of each raft on the webpage. The voting page will be live at approximately noon today. Remember it’s not too late to purchase Chuck-a-Ducks at the start and finish lines for a chance to win cash and other valuable prizes from the Rockford IceHogs. They say, ”God only gives you so many days, but the ones you spend at sea don’t count against you.” Argh! We think that’s true for all the proud rafters on the river today, too. Enjoy your freebie and good luck to each and every one of you. See you on the river! 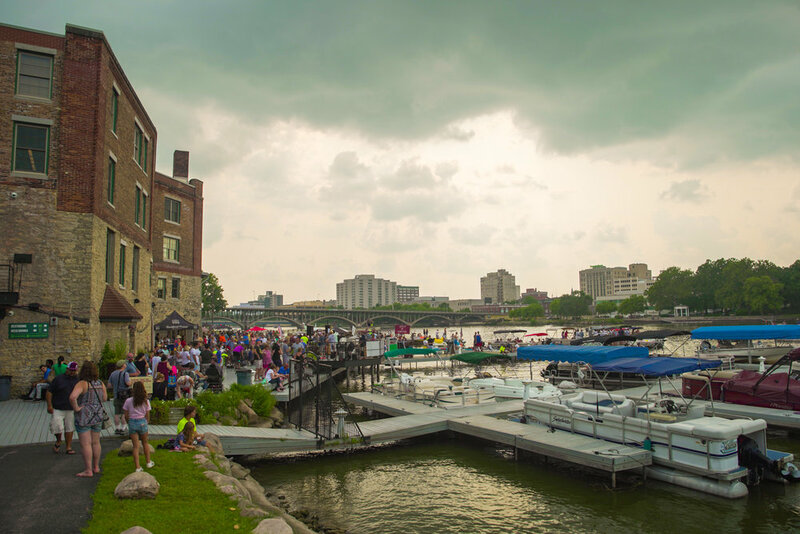 Sharing a fine blog post by talented Rockford Area Convention & Visitors Bureau Summer Intern Jaclyn Lindquist. Thank you, Jaclyn! 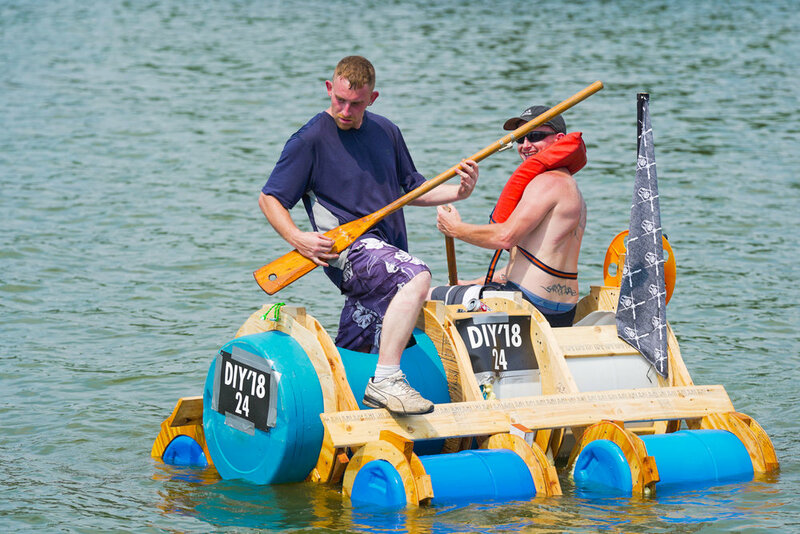 There are so many ways to participate in the Rock River Anything that Floats Race. I don’t know about you, but I have never crafted my own boat, canoe, kayak, or raft. 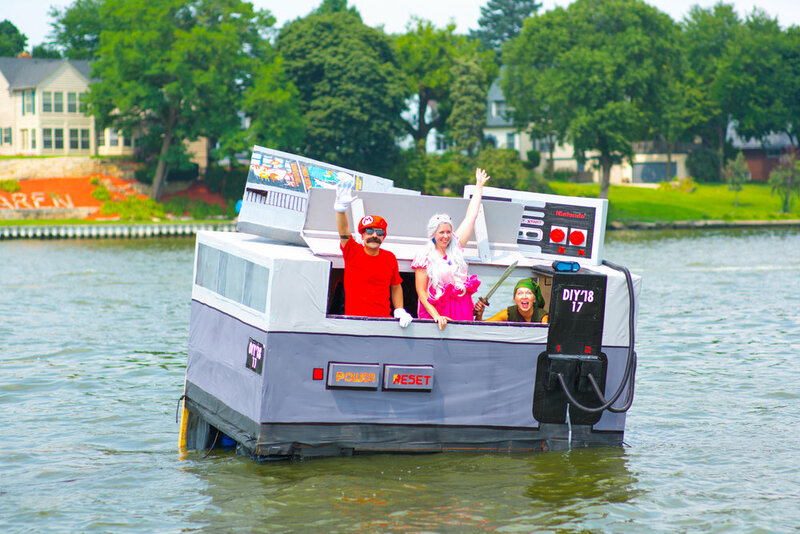 I try to stick to water crafts that won’t sink! My efforts to support the RRATFR are better on land. This way there will be no causalities from a poorly built raft. However, as an extremely competitive person, I want to be involved in the competition aspect of race day activities. Luckily, I can race my duck! No, no, no, not a real, living duck, but a little rubber duck! 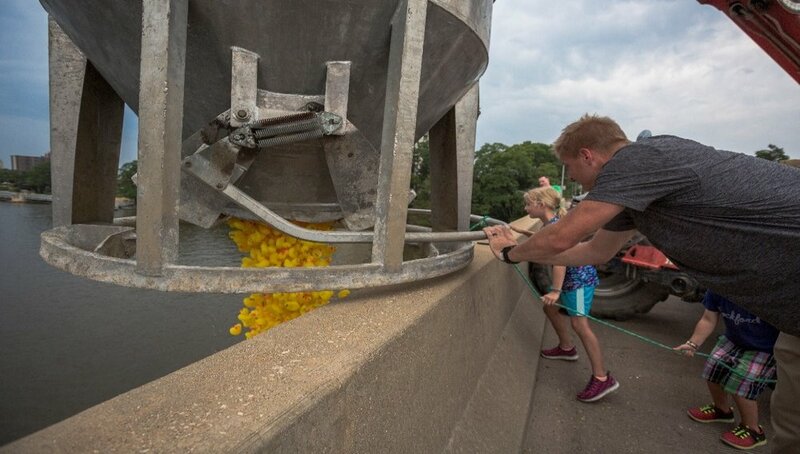 The RRATFR will hold their annual Chuck-a-Duck at 3:30pm, after the raft race, on August 12, 2018. 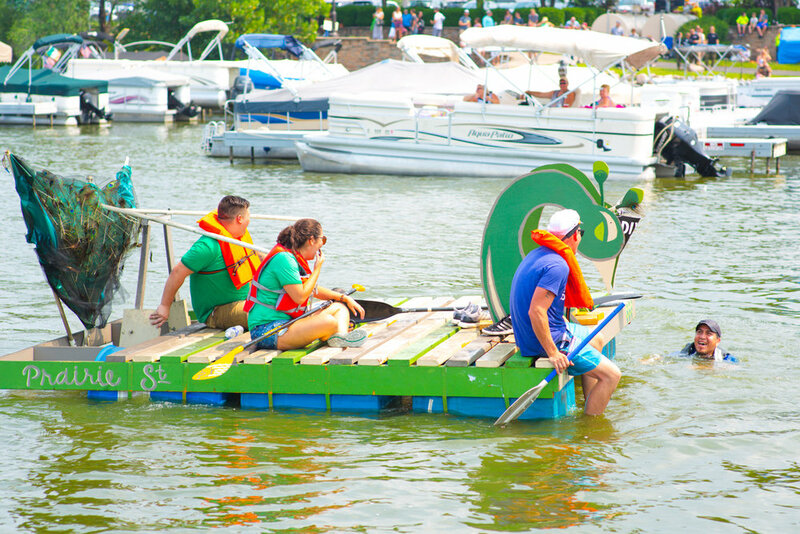 Chuck-a-Duck is a fun, exciting way to get involved in the race while keeping two feet on land. How does chuck-a-duck work? Glad you asked! 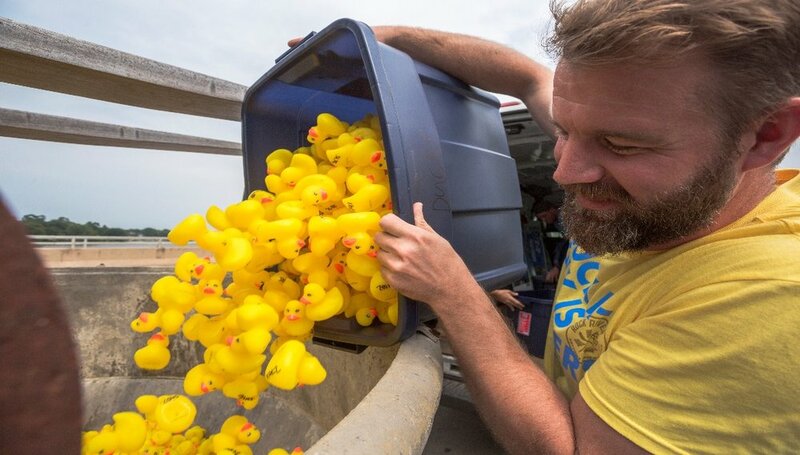 All ducks are loaded into a large crate on race day and carried on a truck to the Whitman Street Bridge. After a countdown, the ducks are released from a cage and drop into the Rock River below. The ducks then float their way down the river until they reach the Prairie Street Brewhouse. The first twenty ducks to cross the finish line, win a prize. Well, the ducks don’t win the prize, YOU win the prize! Each duck has a number written on the bottom that corresponds to the name of the duck’s owner. So, while putting in no work at all, you could win a cash prize of $1,000, $500, or $250 or other valuable prizes provided by the Rockford IceHogs! Where can I get my duck? Excellent question! Ducks can be purchased all over Rockford. Of course, ducks will be sold on RRATFR day, but if you want to think ahead, ducks are sold at City Market at the B-103 Radio Station booth, Prairie Street Brewing Co, BMO Harris Bank Center Box Office and all Rock Valley Credit Union locations. Ducks are sold for $5 each, but don’t let your duck float alone when you can purchase five ducks for $20! For every you duck you purchase, the better chance you have at winning one of the prizes.